During Lent, we prefer a good stir-fry over a fish fry. Stir-fried baby bok choy, shiitake mushrooms and tofu is one of our favorite meatless Friday dishes to eat with a simple bowl of steamed rice. This healthy and hearty dish features a popular variety of Chinese cabbage (bok choy)—a green vegetable option that is considered auspicious especially in the lunar new year—as well as “meaty” mushrooms and protein-packed tofu in a tasty sauce. Savor this simple stir-fried dish during Lent Fridays, lunar new year celebrations and National Cabbage Day. Wash and dry the baby bok choy. Chop off an inch from the bottom stem (reserve “rosettes” for optional garnish). Slice leaves into 2-inch pieces. In a shallow bowl, soak the dried shiitake mushrooms in hot water for 30 minutes or until softened. Squeeze out excess water. Slice into strips. In a wok or large skillet, heat 1 tablespoon of canola or vegetable oil in medium-high heat and gently stir-fry the tofu until lightly browned (do not fry the bean curd puffs if using). Transfer to a plate and keep warm. 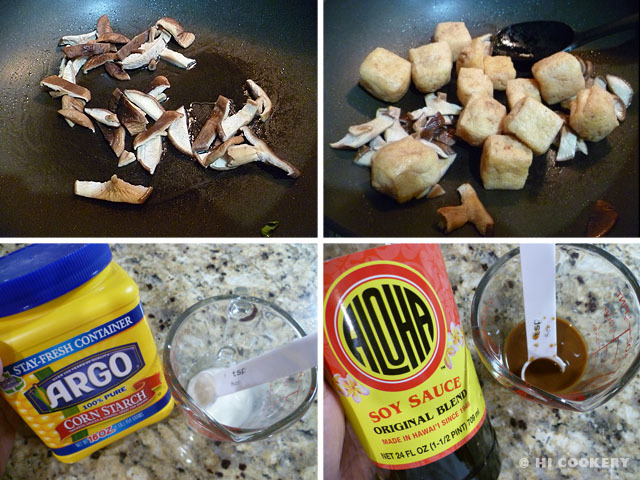 In the same skillet, add another tablespoon of oil and stir-fry the mushrooms for 2 minutes or until softened. Transfer to the tofu plate. 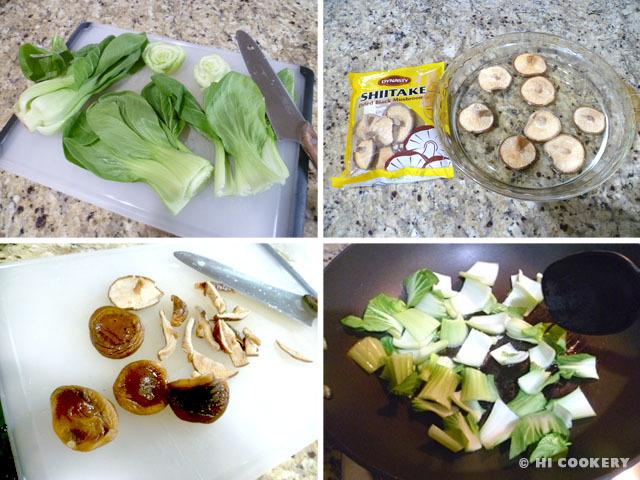 Add the last tablespoon of oil to the skillet and stir-fry the baby bok choy for a minute. 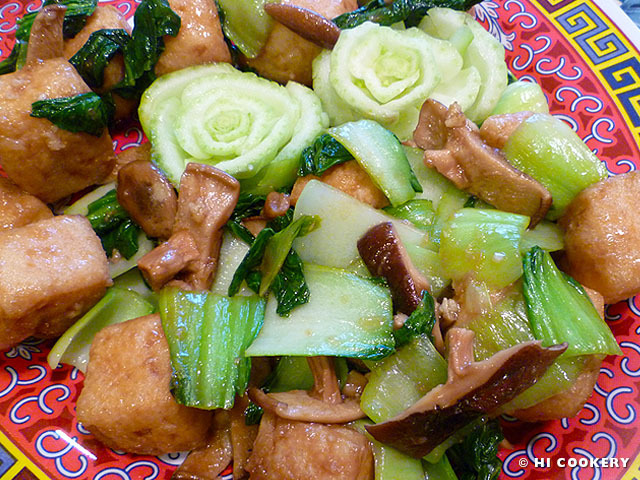 Return the tofu and mushrooms to the skillet and mix with the baby bok choy. 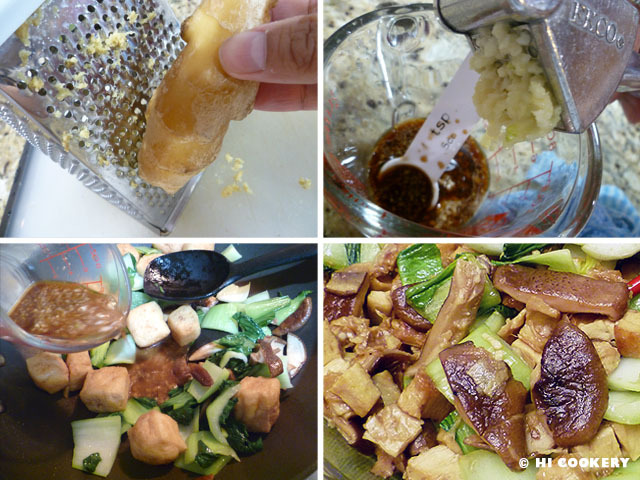 In a small bowl or measuring cup, make a slurry with the cornstarch, water (or mushroom liquid), soy sauce, grated ginger, minced garlic and sesame oil. Pour it into the skillet and mix well until slightly thickened, coating the tofu, mushrooms and baby bok choy well. Transfer to a serving platter immediately and garnish with the baby bok choy “rosettes”. Serve hot. We prefer rehydrated shiitake mushrooms over the fresh ones as the dried shiitake have a stronger flavor.